February 25 to March 3 is Freedom to Read Week at the library. It is at this time that we encourage all Canadians to think about what it means to have the right to read whatever material we choose. Intellectual Freedom is something we should all be grateful for. Congratulations to the winner of the I Love to Read Month Crossword Puzzle! Answer Keys can be found at the library and a copy is also posted on the bulletin board at the Post Office. A new month means another opportunity for you to win a movie pass to the Glenboro Gaiety Theatre . . . This month’s contest is inspired by the board game ‘Boggle’. 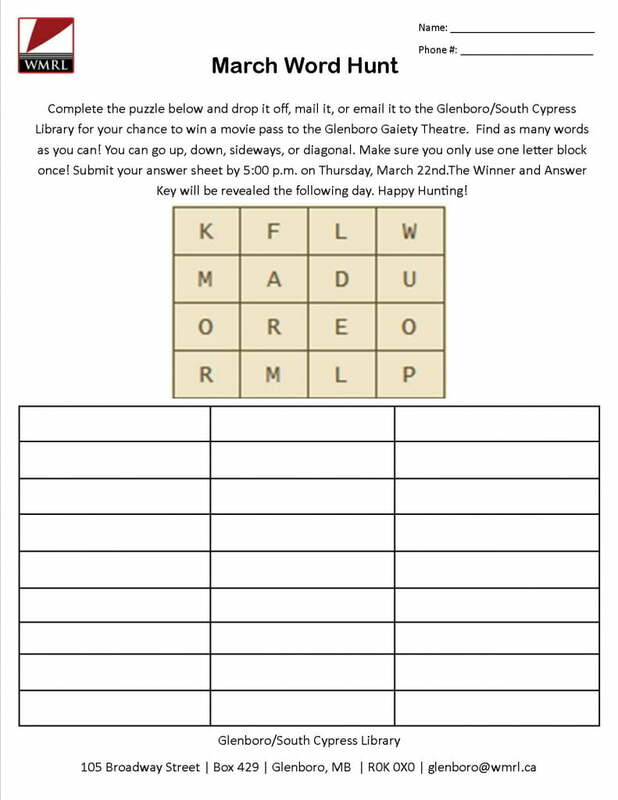 This month’s puzzle will be available at the library and on the bulletin board at the Post Office. Try to find as many words as you can and then drop off, email, or send in your answer sheet to the Glenboro/South Cypress Library-105 Broadway Street/Box 429, Glenboro, MB, R0K 0X0/glenboro@wmrl.ca. Speaking of board games, the Glenboro/South Cypress Library now has space for you to play board games! Stop by and see what we have to offer! You can play with a group or by yourself. Just a quick note; these board games are non circulating, meaning they have to be played at the library. Hope to see you soon! The Glenboro/South Cypress Library is open Tuesday to Friday from 9am to 5pm. I Don't Want to Go to Sleep! We Don't Eat Our Classmates! The library hosts three monthly general-interest book clubs. Book Club One (facilitated by Danielle) meets the first Monday of the month. What we read is up to the group. We usually pick fiction, though not always. Books are supplied by the library, and meetings are facilitated by a library staff member. For more information about upcoming reads, contact Danielle at Danielle@wmrl.ca. Join us for an afternoon of Scrabble, coffee, and laughs. Scrabble boards are provided by the library and all levels of skill are welcome. No need to register for this drop-in program. Run in collaboration with Big Brothers and Big Sisters of Brandon, CoderDojo is open to any youth between the ages of 7 and 17 who want to try their hand at coding. Projects include Scratch, HTML, Python, and more. Some computers will be provided, though participants are strongly encouraged to bring their own if possible. The group is facilitated by adult mentors. Please register ahead of time at the Children’s Services Desk, or by phoning 204-727-6648. Registration opens Monday, January 7. For more information, email Danielle@wmrl.ca. 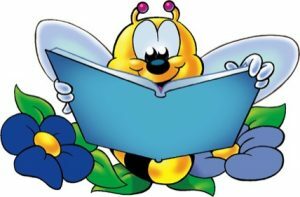 The spring session of Storytime at Neepawa Library runs Fridays, April 5th to May 17th at 11:00 am. Join us for stories, I Spy and crafts! No registration is required. The first Saturday of the month, kids ages 5 to 8 are invited to join us for 45 minutes of LEGO fun and construction. The program begins with a story or other group activity, followed by construction time. Each month has a different theme, and construction guides are provided to help kids along, though free-rein creativity is also encouraged. The last few minutes of each program are set aside for showcasing, where kids can demonstrate their creations to the group. Registration for each session opens two weeks ahead of time (ie. Registration for the February session opens Saturday, January 19). For more information or to register, please visit the Children’s Services Desk, or phone 204-727-6648. This casual, friendly conversation group is for anyone who wants to improve their English vocabulary, pronunciation, or confidence. Mix and mingle with English-speaking volunteers for an afternoon of games, refreshments, and conversation. All levels of English are welcome. No need to register. Please arrive on time, as the program begins at 2:30 pm. For more information, phone 204-727-6648 or email Danielle@wmrl.ca. © 2019 Western Manitoba Regional Library - All rights reserved.